The British Parliament has approved a Government plan to join the international alliance bombing Islamic State targets in Syria. After more than 10 hours of debate, the motion in favor of action passed 397-223. Ahead of the vote, British newspaper columns had been filled with discussion of a new “war”, while those opposed to the airstrikes drew parallels with the catastrophe of the intervention in Iraq in 2003. Both of these are exaggerations. Britain’s bombing will not be significant and it certainly will not be part of a coherent strategy against the Islamic State, let alone a reasonable approach to Syria’s 56-month conflict. This is no more than a political sideshow, a diversion from the core issue – namely the continuing civil war between President Bashar al-Assad and his opponents. The marginal nature of any British air campaign is illustrated by the status of its forces in the region. The Royal Air Force has a total of eight Tornado jet fighters available. That’s one-third of the number needed for even a minimal, sustained campaign against IS. It can also supplement the force with Typhoon fighters, but these cannot carry laser-guided, high accuracy Brimstone missiles. There are also questions about the effectiveness of the international campaign as a whole. As has been demonstrated by the experience of the US-led coalition’s bombing of IS since September 2014, airstrikes have only a passing effect unless they are accompanied by ground operations by local forces. One of the more successful excursions into Syria came in January 2015 when Islamic State lost the strategic town of Kobane. But that was in no small part thanks to the work of Kurdish troops on the ground. In theory, British operations could be part of a coalition effort supporting a Kurdish-led assault on Islamic State’s central position in the city of Raqqa. However, Kurdish political and military leaders have bluntly told the US, which has pressed the idea, that they have no wish to advance on Raqqa as it lies outside Syrian Kurdistan. Another possibility is that coalition airstrikes could assist Syria’s rebels, who have been battling IS since January 2014, and build up a protected zone in northern Syria. But the US has repeatedly rejected any cooperation with rebel groups, and indeed shown little knowledge about the state of the rebel forces. That American evasion has its echoes in this latest diversion from the UK. Since summer 2013, when its parliament rejected intervention after the Syrian military’s chemical attacks near Damascus, the UK government has been at a loss as to how to deal with an Assad regime propped up by the economic and military support of Russia, Iran and Hezbollah. The threat of IS offered a way for the UK prime minister, David Cameron, to show he was doing something, even if that something meant little for the course of the Syrian crisis. 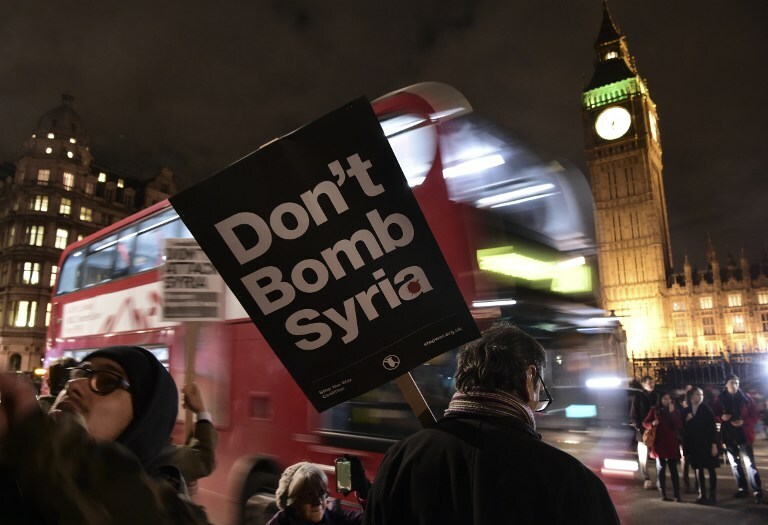 In the summer, the British government tested the idea of airstrikes but was rebuffed by MPs. So it carried out drone attacks that killed two British members of IS. The same pattern was repeated in early November. Parliament’s Foreign Affairs Committee firmly dismissed the idea of airstrikes, saying they would be ineffective. The following week, Cameron backed a US drone strike that killed Mohammed Emwazi, better known as Jihadi John, the British IS executioner. But two days later the political climate changed with the attacks in Paris that claimed by IS that killed 130 people. Now airstrikes, first by the French and now by the British, could be presented as the essential response to the primary threat of this global menace. Meanwhile, as Cameron seized his political opportunity, Russia has been pursuing its own deadlier strategy. Under the guise of a campaign against the Islamic State, Moscow has stepped up its airstrikes on opposition-held areas following the November 24 downing of a Russian warplane by Turkish jets near the Turkish-Syrian border. Border crossings, infrastructure, and civilian sites were destroyed as Russia supported the Syrian military, Iran, and Hezbollah in their offensives against “terrorists”. Publicly Cameron says bombing Islamic State is part of a wider strategy which includes pursuing a political resolution and humanitarian assistance. Privately British officials are admitting that London is little more than a bystander as the US tries to seize the initiative from Russia. Secretary of State John Kerry has set a goal of a settlement by late March, with ceasefires, UN monitoring, and regime-opposition talks. That ambition is almost as divorced from reality as the British “war” against IS. The Assad regime will not enter any process which foresees the departure of the President, but the Syrian opposition and rebel factions will not begin talks unless their security is assured and a transition includes Assad’s relinquishing of power. The Cameron government’s token airstrikes will do offer nothing to deal with that conundrum. Indeed, they are likely to add to the difficulties. Both Russia and President Assad will welcome the focus on IS — even as they proclaim that the US-led coalition continues to do little about “terrorism” — because it distracts from their continued attempt, with air and ground attacks, to punish the rebels and the opposition’s cities and towns. There will be short-term “winners”. Cameron will celebrate a victory for his authority and the disarray of the opposition Labour Party. London’s newspapers have their dramatic headlines. Moscow and Damascus will get a bit of political breathing space, and the Obama administration will proclaim an advance in the war on Islamic State. But those winners will not include those who have paid the highest price, such as the seven hospital staff and patients killed by barrel bombs in Homs Province last Saturday, the 44 victims of a Russian airstrikes on a market in Ariha in northwest Syria on Tuesday, or the 50,000 people whose main bakery and water supply were destroyed by Moscow’s warplanes in Idlib Province this week. For these Syrians, and millions more, the death and deprivation will continue.